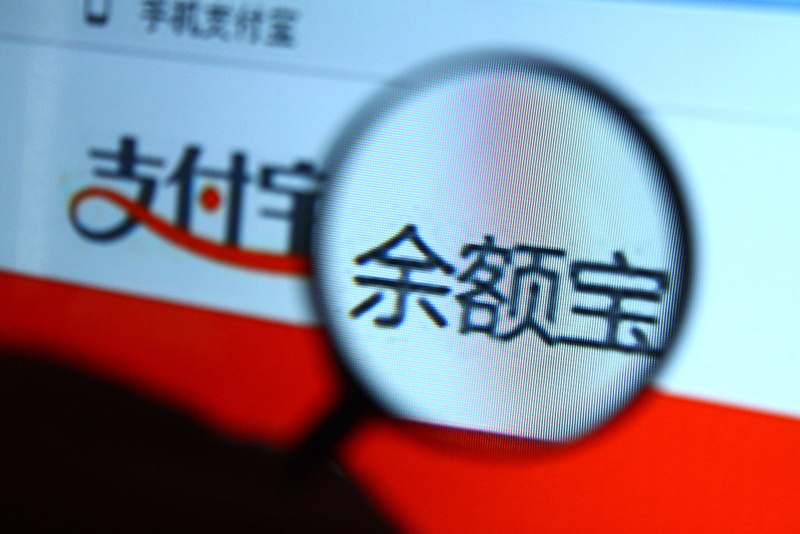 Alibaba is already well renowned for its Taobao service, which is China’s closest equivalent of EBay. It provides excellent service and at massively low prices. So what more could you ask for? Well Alibaba believe you also want better wealth management products. Their newest gem, Yu’E Bao, literally meaning “leftover treasure”, is a money market fund set up through their Alipay brand (Alibaba’s answer to Paypal of course), and sold through Tianhong Asset Management Co., Ltd.
Yu’E Bao gives users something that is long overdue, a financial product that produces adequate returns and can be accessed with ease. Individuals and especially the youth have piled up to put their money in and have helped grow the fund to be the largest in China. Yu’EBao’s growth has been incredible and is the main reason Tianhong Management Ltd., Co. has surpassed China Asset Management Co., Ltd as the largest fund company in China, as per asset value. To put this globally, according to Bloomberg the fund is the 14th largest in the world. This all from a fund that is only 9 months old, that is some milestone. The fund started in May 29th, 2013 and grew its assets 1211.3% from ¥4.2 billion yuan to ¥55.65 billion by quarter 3. The growth however did not stop there. An additional 242.08%increase came and the fund went to 190.38 billionyuan by the end of last year. ¥190 billion yuan is equivalent to $31 billion US dollars. So no wonder it has received so much attention. The fund’s growth has been extraordinary and has continued to grow into this year. Recent reports show that if that wasn’t enough growth for you, Yu’EBao managed around ¥250 billion based on January 2014 figures. That is an additional 31.32% on Q4 closing figure. 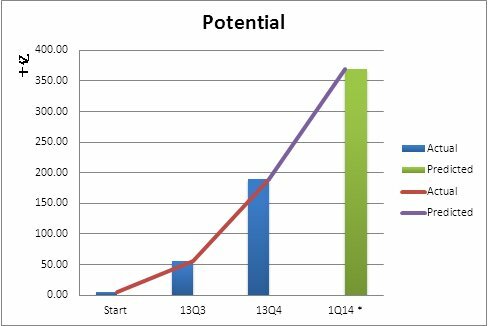 The only difference now is that we are getting into truly extraordinary numbers, if the 31.32% continues for the rest of the quarter; the fund would be sitting in the 350-400 billion range. All within basically 3 quarters of a year. As you can see, unless something serious happens to hinder their progress, Yu’E Bao is going to grow into something that will completely dominate the . That’s all well and good but let’s put a wider perspective onto those numbers. China’s total bank deposits as reported by People’s Bank of China are at a staggering 104.38 trillion yuan at the end of 2013. That is a lot of money and makes Yu’EBao look more like childhood pocket money rather than anything substantial. 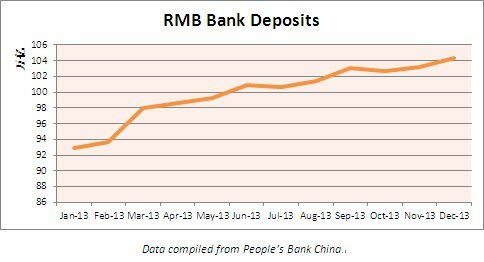 And to the contrary, bank deposits have still maintained nearly month on month growth despite Yu’EBao’s presence. Still, the fact the Yu’e bao is even mentioned as a systemic threat to China’s bank deposits shows how far it has come and so quickly. So we have established Yu’EBao will not be breaking the banking industry anytime soon, at least any of the serious banks. However let’s not get carried away. Let’s look at this from yet another angle. Yu’EBao’s reports profits of 361 million yuan in quarter 3 and then by quarter 4 they rose to 1.4 billion yuan. Comparing this to one of the banks. ICBC, whohas a reputation of being the world’s most profitable lender, made 67.2 billion yuan in net income for 2013. 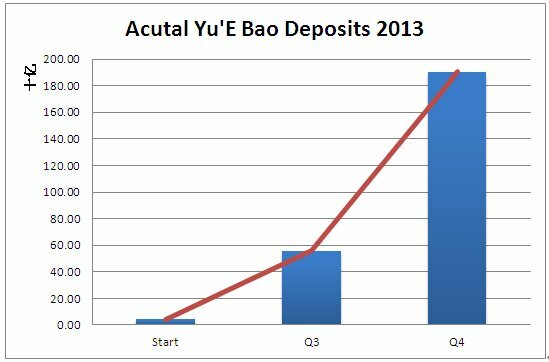 To summarise, relatively speakingYu’EBao deposits equalled about 0.18% of the banks total deposits. But their single Q4 profits equalled the same as 2% of ICBC total annual profit. That’s something to be proud of. Now for the big issue, let’s talk returns. Yu’EBao currently offers investors 6.241% per annum on their accounts. This is well above what the banks currently offer on their general deposit account of around 0.35%. It must be noted that the banks have no say in their rates and they are capped at 0.35%. What this means is that as the banks are supervised by the China Banking Regulatory Commission, they impose certain restrictions. These include limits such as the amount of capital they must hold and the rates they can offer on their products. But maybe you’re optimistic. While none of us knows what the banks will offer in the future, their track record in the last half decade has hardly given us a reason to jump for joy. There are other options though. But don’t get too excited, unfortunately they too aren’t that great. Putting your money away for 5 years will only give you a return of 4.75%, which is still disappointingly less than the far more flexible Yu’EBao. Naturally, people’s aim is to get as much return as possible while sacrificing the least flexibility. It is fair to say though people would like returns to be at least above inflation; otherwise their real returns are negative. This really highlights the true value of Yu’EBao. You can see why thepublic are frustrated with what they have on offer.The current strategy seems to be, limiting the amount you lose rather than really gaining anything with your hard earned cash. It is clear that putting your money in the bank is not really worth it. There is only one clear winner here. After it is clear that putting your money in the bank account is worth nothing financially, perhaps it can win customers over from its brilliant service or itsattentive staff. Sorry folks I have to say that the banks fall short again. Now don’t get me wrong Yu’EBao does not offer much, it just offers what the customer needs, nothing more, nothing less. The bank’s service on the other hand can be described using many words; I will limit myself to just one, awful. Whether it’s the long queues, the rude staff or just the clear lack of any assistance, the service you receive will leave you bitter and stressed. Let’s be honest some of them are not directly their fault. China is the most populous country in the world and that is a fact. This isnot helped by how densely populatedsome cities are. Regardless, the banks do themselves no favour by using a cold hearted bureaucratic numbering system. On the other hand, with Yu’EBao’s gone are the days where you have to inconveniently allocate half a day just for going to the bank. With its quick and easy to use smart phone app or website, one is able to take money in and out seamlessly. Of course this does mean if any trouble may arise you only have non-physical means of communication. This may end up being a colossal issue, but for now Alibaba and Taobao have operated for years and had little problems. They are still seen as a tremendously successful company that has succeeded due to their quality and ease of service. Now for the bad news, Yu E Bao is on face value amazing. It offers great returns, is easily accessible and the majority believe it is guaranteed. Money market funds are seen as extremely safe, at least historically wise. They invest in low risk financial assets such as certificate of deposits (CDs) or treasury bills (T-bills). However they are not invincible and one must avoid viewing these as completely risk free. They are not a savings account. The fund can still “break the buck”, which is a term used for the situationmoney market funds face when net asset value falls below $1. As of such income does not cover expenses and can happen for a number of reasons. This will then lead to crippling confidence and investors withdrawing cash en masse. Given the instability recently with the RMB and some shadow banking problems, nervousness can get spread suddenly. This advances me onto the next issue. A bank run is just like what I described; whereby the public go to withdraw their cash in such large numbers that the bank cannot keep up. The Chinese believe that everything is guaranteed or at least it should be. But the hard truth is, Yu’EBao is not formally guaranteed, only morally.The banks nonetheless have to provide guarantees and if they cannot fulfil those guarantees the Government will likely bail them out. Analysts argue that since the situation is slightly more complex for Alibaba, as they will not be directly at risk. Since Alibaba owns 50% of Tianhong and Tianhong are the ones that manage Yu’EBao, Alibaba has no liability to repay investors. Some estimate they will, as it could end up destroying their reputation too severely. But for investors, the uncertainty and lack of clarification is not good news. The banks have another advantage; Alipay is vulnerable to being hacked. The banks get attacked constantly and have measures to deal with this. The banking system is far more secure.Alipay however, once hacked, will give the hacker access to buy whatever they want. We are not saying that the banks cannot be hacked. Just at least if they were hacked like I said above, there will likely be some sort of support from the bank themselves or the Government. But the risk is only going to worsen as the fund becomes bigger and attracts more attention. Yu’EBao currently invests around 85%-90% of their fund in the interbank market, the rest is somewhere in other assets or debt securities. The money is therefore ending back at the banks, albeit at a higher rate, thus depressing their returns. The banks face a problem every now and then (usually every quarter) whereby the cash supply is stretched. Seasonal holidays such as Chinese New Year bring with it a problem whereby as of proven tradition, Chinese go to withdraw cash for hongbao, literally red packets full of money to gift their family member. This was part of the reason for the January spike in interbank interest rates.Alibaba with their cash surplus can therefore cause interest rate volatility by restricting or promoting lending. If Alibaba lend less, the banks will be forced to up the rate in order to entice new cash sources. This creates instability and poses a potentially dangerous system risk that could disrupt the equilibrium. For the future, I predict one of three scenarios will happen: Firstly, the Chinese Government intervenes and either imposes restrictions or stops the fund altogether. Secondly, an equivalent of a bank run occurs, where cash is withdrawn en masse and the fund breaks down. Last and least likely, the fun continues for an extensive period until a small regional bank goes broke. Whatever the future holds, Alibaba will continue to downplay any assumption that their fund can be potentially damaging, otherwise they will just be forcing restrictions on their newest jewel. But with other tech savvy firms such as Tencent and Baidu now entering for a piece of the pie, the pressure for regulation is going to increase. I do not believe that Alibaba will be breaking the banking industry right now, but it is not to say that they could not cause serious harm. Banks are known for, at times, trading at dangerously low liquidity levels. If cash deposits dwindle, this could cause a small regional bank to go bust. If they do cause a bank to default on one of its loan there will certainly be chaos in the market, something China will want to avoid. Likewise if their fund fails in some way, they will be faced with the hard decision to either compensate investors or do nothing. It is feasible to believe they will want to protect their reputation so some sort of relief will be provided. One positive thing to come out of this is banks are not happy.Their profits are essentially being siphoned off by an outcast. It has forced banks to innovate to regain their slice of the pie. ICBC for example have announced a partnership with ICBC Credit Suisse to offer a similar product with a return of around 6% p.a. This leads to improved service for the consumers. For now we will continue to monitor the situation and see if they can avoid following the same path that Paypal’s fund went. Downloading the Alipay app from either Apple iTunes or the Android marketplace. Alternatively, you can invest in by going to the website THfund.com.cn, this website is Tianhong Management’s website directly and it has a number of different funds available. Research and support from Nathan Li on this article. Please note that at current the fund’s language is solely in Chinese. Additionally we do not take any responsibility for any investment decisions; we are not holders of Yu’EBao nor to do we express any buy, hold or sell recommendations.